It’s time to pre-order warm cookies to make sure your office angel gets the heavenly treatment they deserve on April 24th. When you order cookies from Tiff’s Treats, we bake them right away and deliver them still hot from the oven. Ready to find your yum? We are opening in Charlotte, North Carolina this summer! In the meantime, we have a pop-up delivery service available with a limited menu ready to serve you warm cookies now! CookieVision™ now lets you record and send customized video gift messages with augmented reality. Your recipient activates it on their phone using our app with a special code and a Tiff's Treats box. We know you wanted your cookie trays served warm. We did, too. 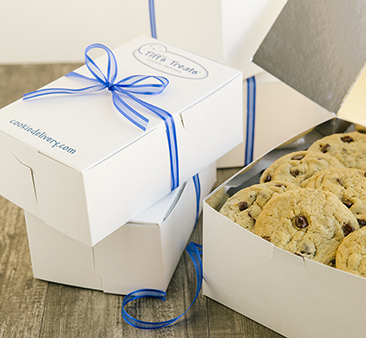 All new liners let us package your cookie tray orders warm so you can now serve warm cookies at your next group gathering! The best way to order Tiff's Treats warm cookies, delivered? Through our app. Repeat orders in a snap, and even track your delivery all the way to your door on the map. In 1999, Tiff and Leon started the company out of his apartment kitchen. 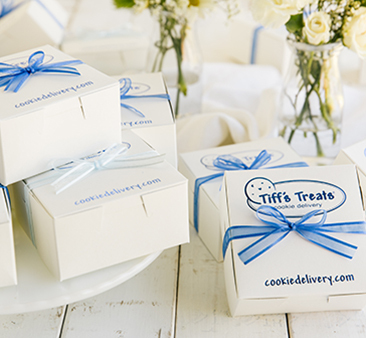 Today, Tiff's Treats delivers warm fresh cookies to happy customers everywhere. Got warm cookies? Love our treats? Let’s get social. Share your pics and follow us on Instagram, Twitter, and Facebook to get updates, news and deals.